The first collection of short stories by Yiyun Li has just been translated into French (1). We already mentioned it in August 2008 at the time of the release in France of Wayne Wang’s film “A Thousand Years of Good Prayers,” inspired by the short story, title of the collection. Amazed by the talent of a writer, totally unknown in France, I even contacted her for a telephone interview. 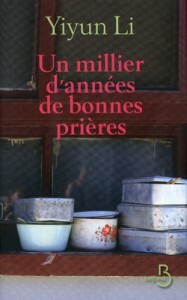 Having won many prizes in the USA, this collection is published in France after the novel by Yiyun Li, “The Vagrants”, unfortunately translated as “A beautiful spring day” (2), a powerful novel at the end of the Cultural Revolution with characters that you remember. 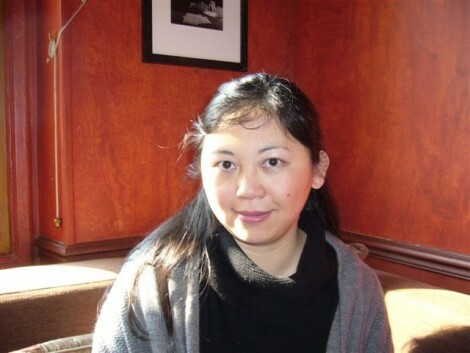 In April 2010, we met Yiyun Li, who came to present her book in Paris and enjoyed her spontaneity, charm and the quality of her answers far away from stereotyped comments that some writers use in interviews. She also mentioned a coming short story collection “Gold Boy, Emerald Girl” (3), not yet translated into French. Short stories that show a great talent; we have already reviewed the title short story but some of the other texts are of the same quality. From China to California, from the Cultural Revolution to the contemporary period, these ten short stories address very different topics but always with the careful analysis of the key characters, that Yiyun Li considers essential and where literature in China is often quite weak. Social issues: an old woman, fired from her job, has remarried to a man struck by Alzheimer’s disease. A peasant harassed (“Persimmons”) by the birth control administration, finally has a son who is drowned by drunken officials. Denial of justice will lead to a bloody revenge. A short story on Chinese current and spoiled youth as “The Princess of Nebraska”, pregnant with a homosexual lover, the former friend of an older man who dreams to raise the unborn child. Sometimes autobiographical as “Death is not a bad joke if you tell it well”, we move from the Cultural Revolution to the modern period in a large house, crowded with different families. The complexity of the characters and elliptical character descriptions can lead to feelings of misunderstanding, as in “The Arrangement”. But sometimes we are amazed: in “Immortality” Yiyun Li tells the recent history of China, seen by old eunuchs in their retirement village, and by developing the story of a lookalike of Mao Zedong , famous and then forgotten after the death of the “Great Helmsman”. Written in an impersonal and detached manner, showing the impact of the horrors of history on some characters who accuse others to protect themselves. Yiyun Li, like others, highlights the constraints of the short story that should be accurate and requires great skills. The short story is also demanding for the reader, who, concentrated, must move from one text to another. “The French do not know how to read short stories as they are approached as the chapters of a novel … how can we understand the success of short stories sold separately and that much more limited of collections”. A collection of eight stories, perhaps more ambitious than the first book, especially with “Kindness”, a long story, very subtle, very well organized. A young girl joins the army at 18, she is the adopted daughter of a disordered mother, married to a much older man. During her schooling, she has visited a neighbor, Professor Shan, who reads in English and teaches her the language. Her lieutenant, Wei, a woman, has an aggressive and ambiguous attitude, but is closer to her and makes life easier for her in the the army which becomes a refuge for her. Another short story is quite contemporary: blackmail on the internet (“A man like him”) and how the Internet and reality join each orther for an old retired professor, how society during the Cultural Revolution or in the age of the Internet, can destroy a man without evidence. A story still taking place in the U.S. and China (“Prison”): death of a child, the desire for another birth, the need for a surrogate mother found in a small Chinese village. A story that also mentions how kindnapped children are used as beggars by mafias. (1) Yiyun Li “A Thousand Years of Good Prayers,” translated from the U.S. Françoise Rose. Belfond 2011, 300 pages, 18 euros. (2) Yiyun Li “One fine spring day,” translated from the U.S. Françoise Rose. Belfond, April 2010, 440 pages, 21.50 euros. 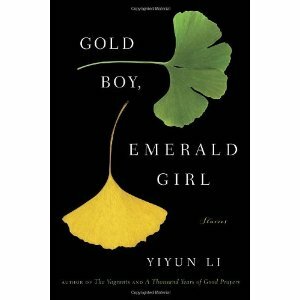 (3) Yiyun Li “Gold Boy, Emerald Girl”, Random House, New York, 2010, 220 pages.